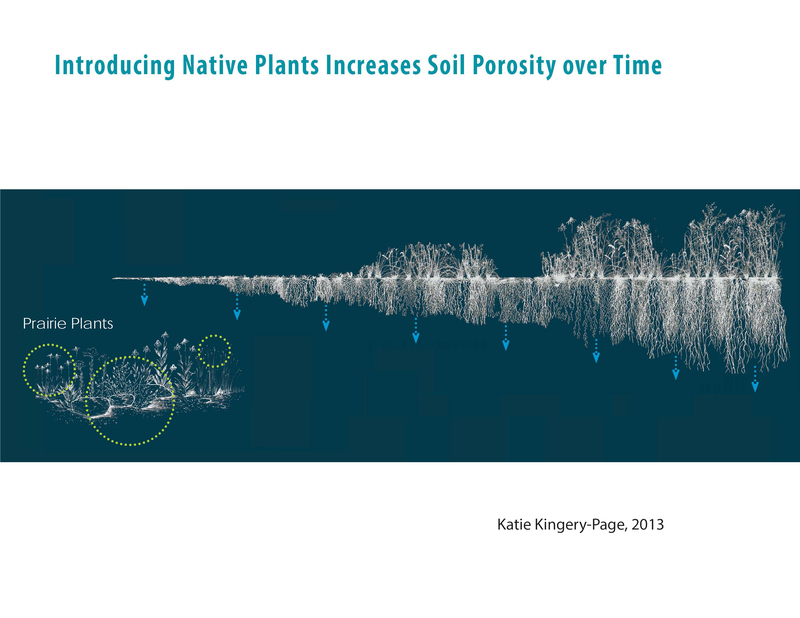 A native plant design is a highly subjective project. The plants you like may not be the ones I would choose and vice versa. Your garden area is unique to you. Sun, soil, moisture conditions can vary as well. The canvas you are painting on will look distinctly different than my artistic design. As we strive to create a sense of place in our landscapes, our medium is the land. Even though each garden is one-of-a-kind, there are a few design principles that we all should follow. Over the coming weeks, we will discuss some of these design principles. Today, we will be tackle lines within the garden. Lines should be used to draw people in and through the garden. They appeal to the senses. They lead you through the garden and help frame views we see or don’t want seen. 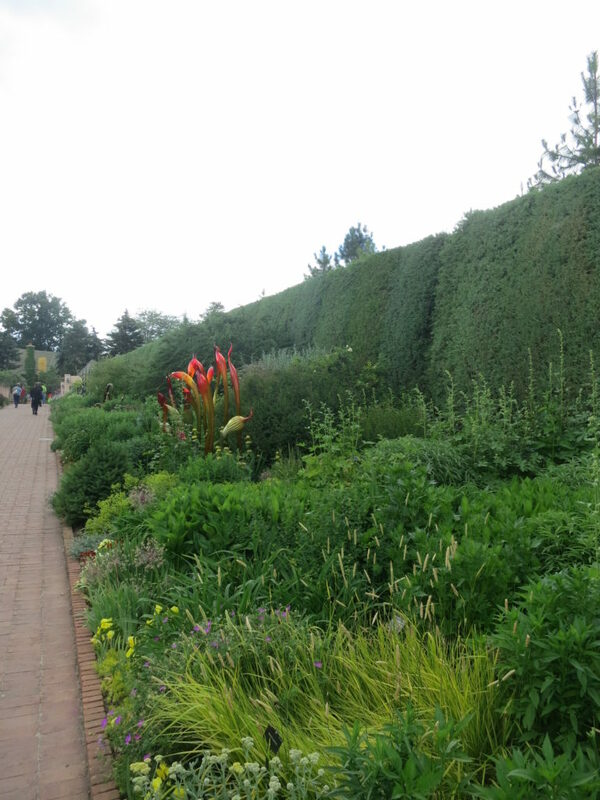 Long, straight rows of plants can be rather formal. They are structural, often symmetrical and lead the eye directly to the focal point like the front door. Straight lines can be boring if you don’t cluster plants and repeat patterns. The strong straight line of a fence can be softened with a sweeping curved edge or accentuated with parallel plantings that run the length of the fence. These lines move you up and down in the landscape. Taller trees, larger structural features such as an arbor should make your eyes go upward. They make the space feel larger and help enclose the space. Just like vertical lines lead your eye skyward, horizontal lines lead your eye along the ground plane. These low lines help define the space and work to tie everything together. 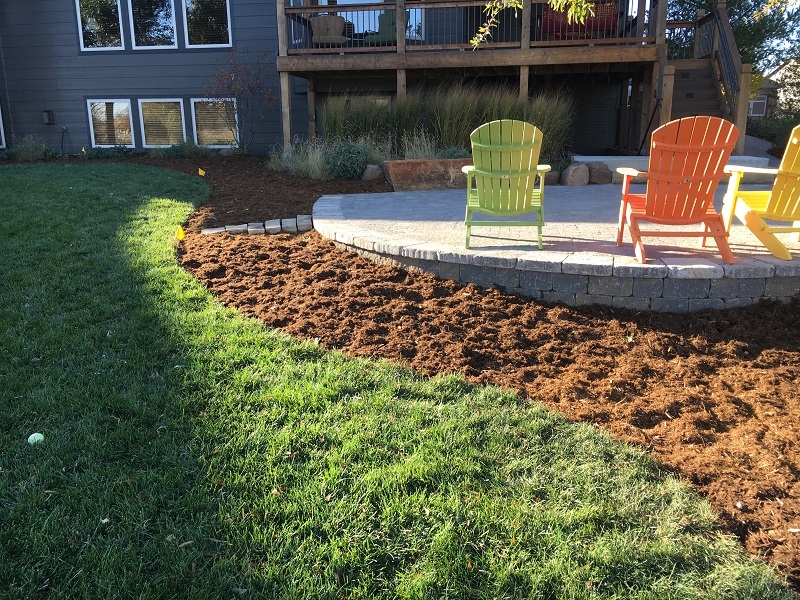 Rock walls, edging with plants or stone, hedges, or a clean line between turf and plants are examples that create these intentional low lines. Curved lines look intentional and informal. Gently bending lines can be used to lead people slowly around a corner to an architectural feature or element such as a bench, garden shed, arbor or vegetable garden, which adds mystery and intrigue to your garden space. Curved lines can help dissolve rigid straight lines of a walkway, fence, house or other structural feature. Curved lines fit better in a natural asymmetrical design using native plants. I like to place a garden hose on the ground to help me visualize these meandering lines. As you step back to look, you are able to move the hose to create the effect that is most appealing before you break ground on your new garden. Be intentional in grouping plants. No matter the lines you use in your landscape, plants obviously play a key role. Formal and informal looks can be achieved with the use of certain plants grouped together or spread apart. Cluster plants together for more visual appeal. 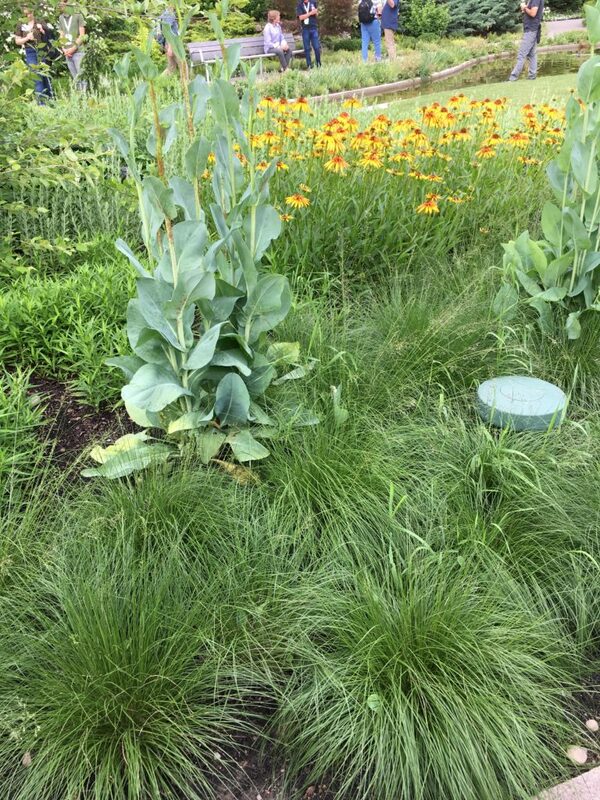 Repeat structural plants like native grasses and incorporate filler plants throughout the design that bloom at different times during the year to draw you into the garden and through the garden. 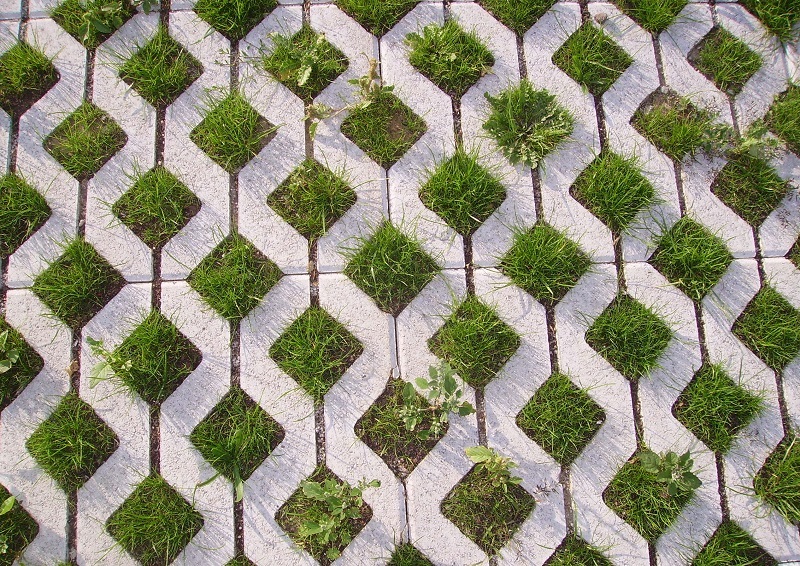 Plants that spill over onto the straight lines of a walkway soften the edge. The possibilities are endless because there are so many plants to choose. How you use lines will distinguish your design from others. Really think about this important design principle and what lines you want to use. Next time, we will talk about plant placement, proportions and scale. 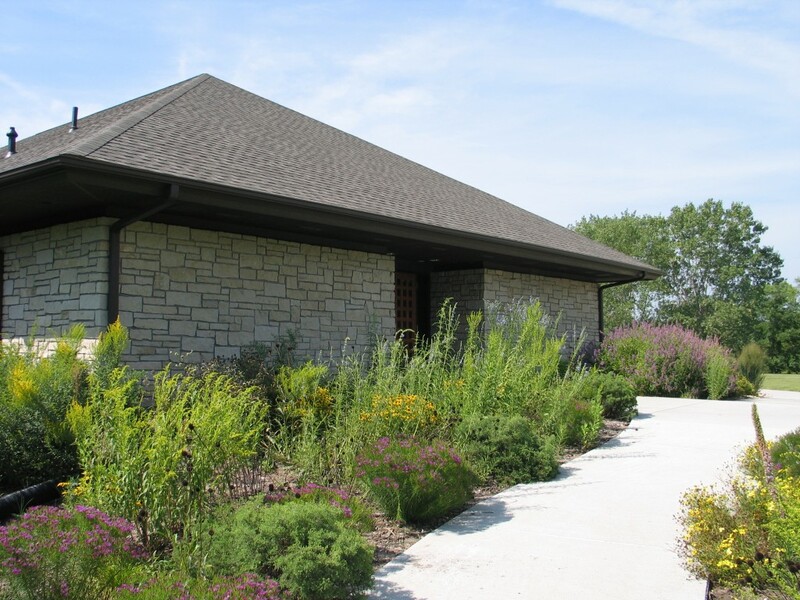 In our Prairie Notes blog, we have talked extensively about the need to utilize native plants in the landscape. 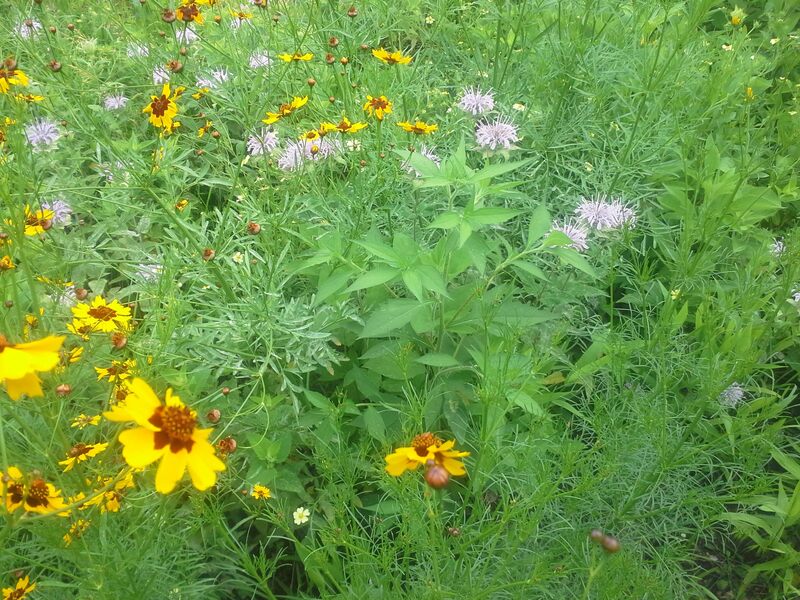 The benefits of having native plants are obvious and many. 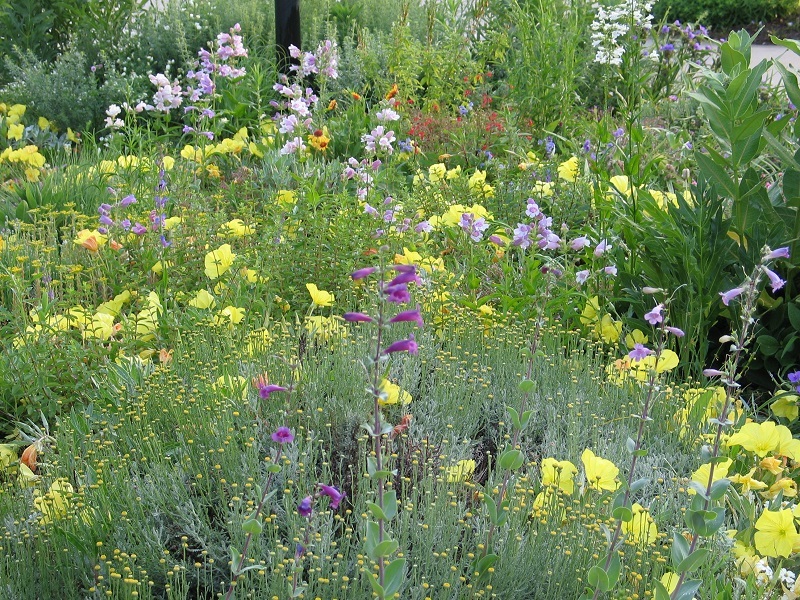 We have shown you pretty pictures with nicely spaced plants and beautiful combinations of wildflowers and grasses. Often, you get the sense that in order to have an attractive garden it has to be perfect. Perfect gardens are maintained by perfect people or by horticulturists who do this sort of thing for a living. I don’t know of too many perfect people. In reality, perfection is in the eye of the beholder. Our gardens are a reflection of who we are and how much time we are able and willing to spend tending these landscapes. In fact, there is a growing trend (pun intended) that focuses less on maintenance and more on the natural order we see in nature. Tallgrass National Preserve in the Flint Hills. Photo by Brad Guhr. The randomness of the prairie is easy to see and it flourishes effortlessly. Plants are intertwined and touching each other. There is not much space between plants. Instead, a matrix of lush, densely organized plants grow harmoniously together. 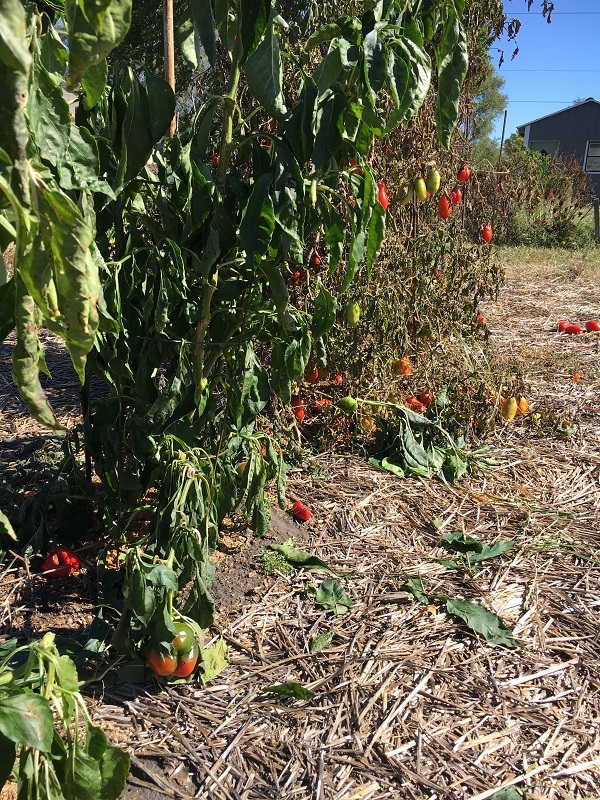 To some, this looks messy and unkempt, but this natural collection of plants has a beauty and resiliency that is also healthy and productive. The thought of an imperfect garden is counter cultural. 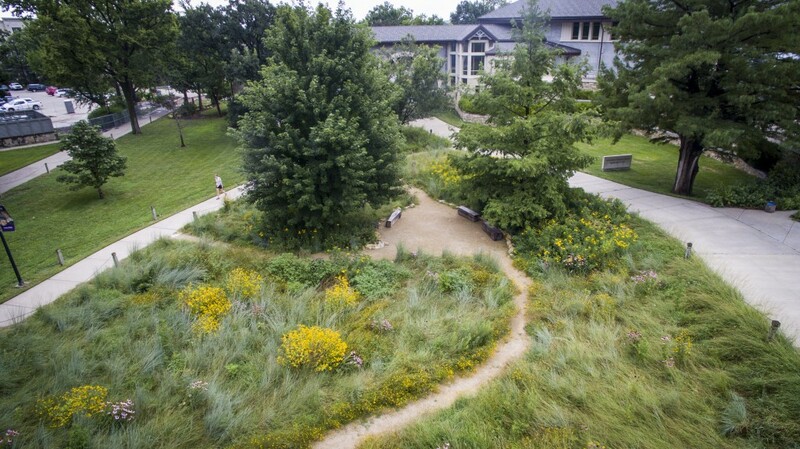 The idea that we would purposely design and then establish plants in our landscapes that mimic the prairie goes against just about every landscaping principle we have ever learned. However, more and more people are embracing the natural landscaping trend. We are creating a sense of place. 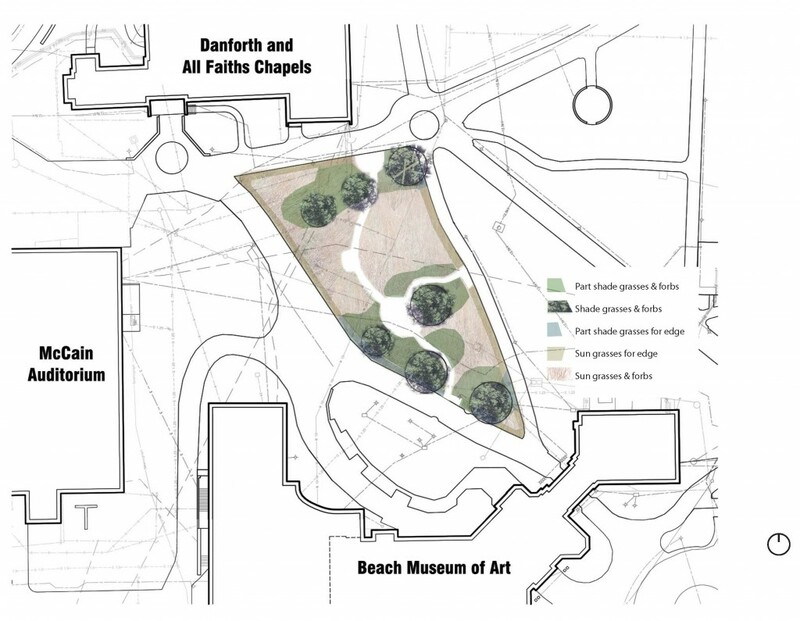 These newly developed gardens incorporate a network of plants by grouping them together with similar growth requirements, and different textures and heights to completely cover the soil. All of these plants crowd out weeds and create layers that look natural in their setting. This idea takes the pressure out of growing the perfect garden and instead allows you to enjoy the process. Imperfect gardens are not zero maintenance gardens. Some level of maintenance is still important, but being tied to your garden will be a thing of the past. 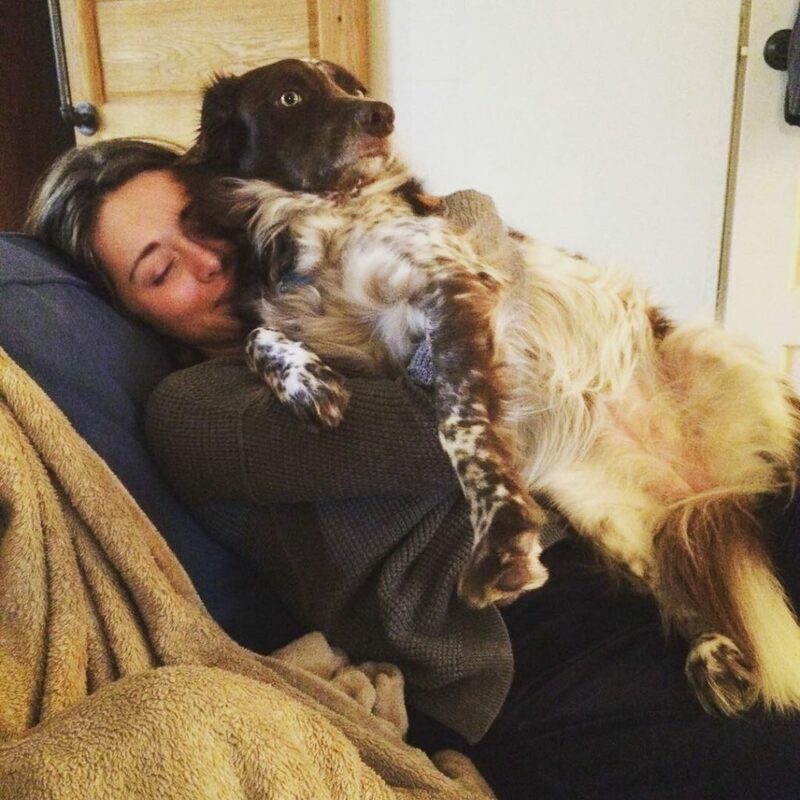 Again, you may have to let some things go and work toward being comfortable having less control of the natural processes. A few dandelions and clover in the lawn can be overlooked. Letting some plants naturally seed and spread along with uneven rows and random plants that have moved from last year can now be tolerated. For us who want to control everything in the garden, we now have permission to back off a little and see what happens. We still need to pull some weeds, especially at first, but as time passes weeds will become less of a problem. An imperfect garden will attract visitors. 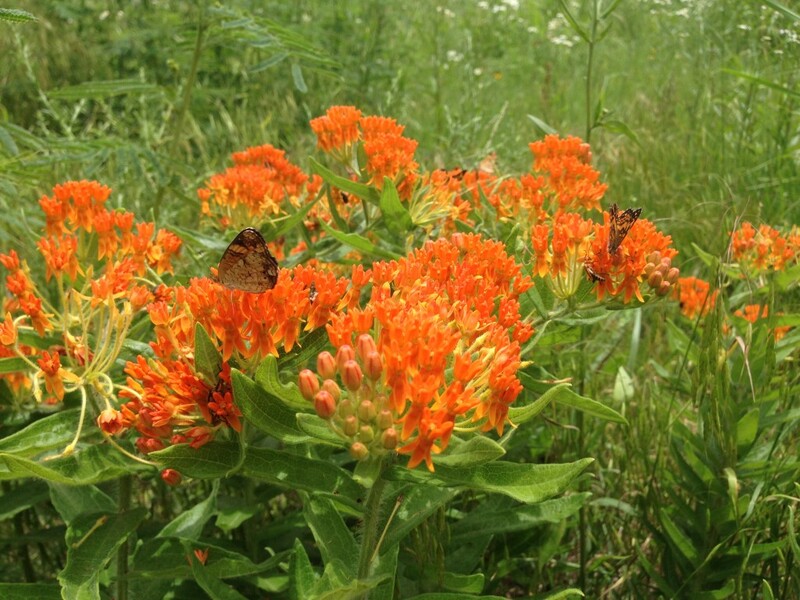 Pollinators, birds, and other wildlife will be drawn to your intentional prairie garden. 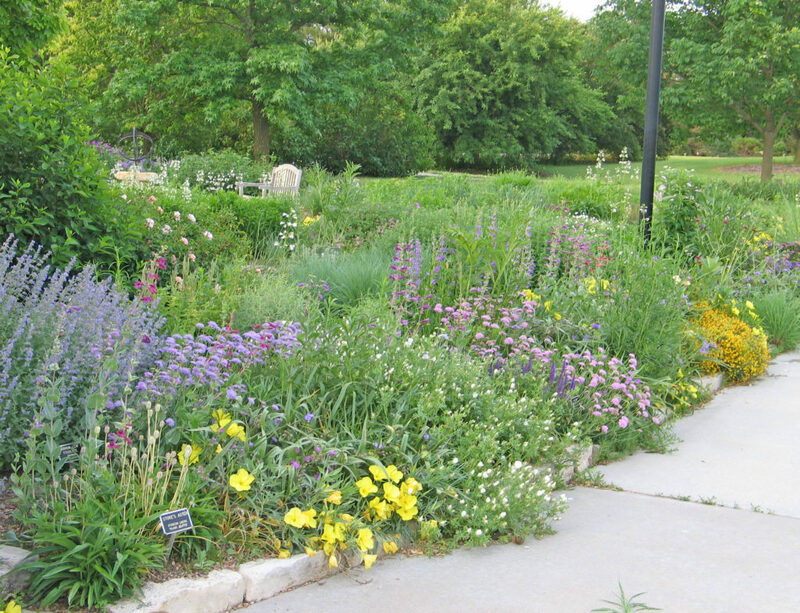 A functional garden will be used, and sometimes abused, by pollinators. Your landscape is providing just what wildlife needs. 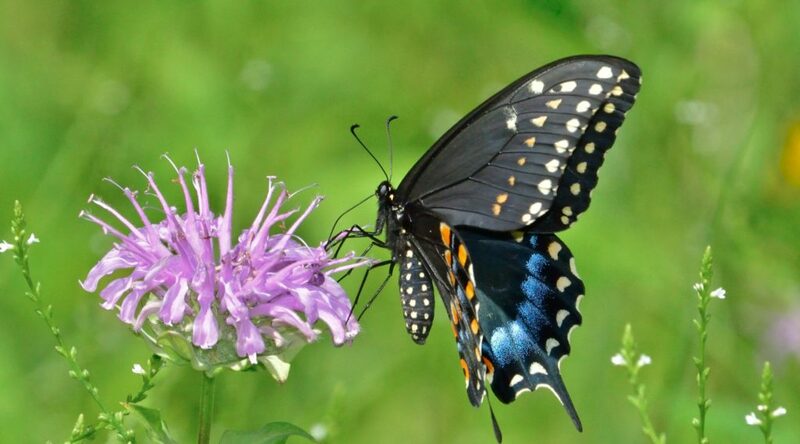 A few eaten leaves and damaged flowers is a small price to pay for helping complete the life cycle of a few thousand pollinators and other wildlife. Even some unwanted pests may visit from time to time. This is a perfect time to watch your imperfect garden take care of itself. Keep the chemicals in the shed and watch the natural predators find these pests and work to eliminate them. Should we really care if they are not all gone? You have my permission to step back and let the little critters work it out amongst themselves. Your garden is a reflection of you. You are already having a bigger impact than you might imagine. Don’t be shamed into thinking that you have to have everything in its place. Sometimes the most aesthetically pleasing garden is sterile and void of plants that actually help the environment. By gardening, you are already an ecologist. You may not have the official title, but you are a good gardener. RELAX, step back and enjoy the process. Don’t stress about the sad little plant in the corner of you garden. If it’s not happy, move it. Learn about what your plants need. Most of us don’t garden for a living, so give yourself a little grace. A perfect garden is one that gives you not stress, but joy. Over the past few years, there has been a renewed emphasis on water conservation. An ever increasing number of communities in Kansas and elsewhere are realizing that water is a finite resource. These concerns are causing them to ask hard questions and ask homeowners to look for ways to reduce water usage, but still keep an attractive landscape. 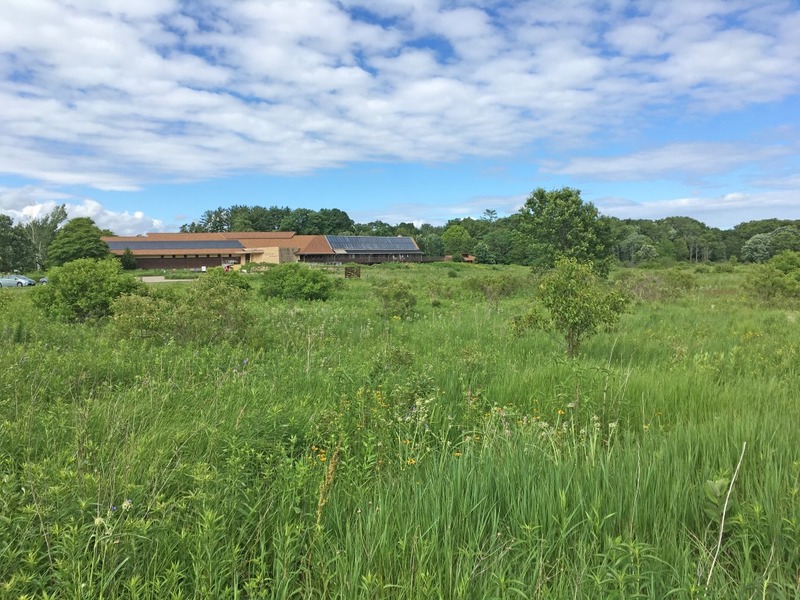 The need for better stewardship of this precious resource, paired with higher municipal water rates, makes this a good time for us all to consider ways to reduce water consumption in our homes and in our landscapes. The basic approach to reducing water usage in the landscape centers on efficient design, proper site preparation, and the use of low water-demand plants. All these work together to help conserve water. Collectively, these principles make up an approach to landscaping termed “xeriscaping” (“xeri” meaning “dry”). Tha Arboretum xeric bed in May. From the standpoint of design, a key principle is the reduction of turf area. Turf grasses such as fescue and bluegrass demand the most water of all of the components in the landscape. Consequently, reducing the amount of area planted with these turf grasses and thinking strategically about where and why we need turf areas will make a tremendous difference. Replacing them with deep rooted perennials and shrubs will also reduce water usage. 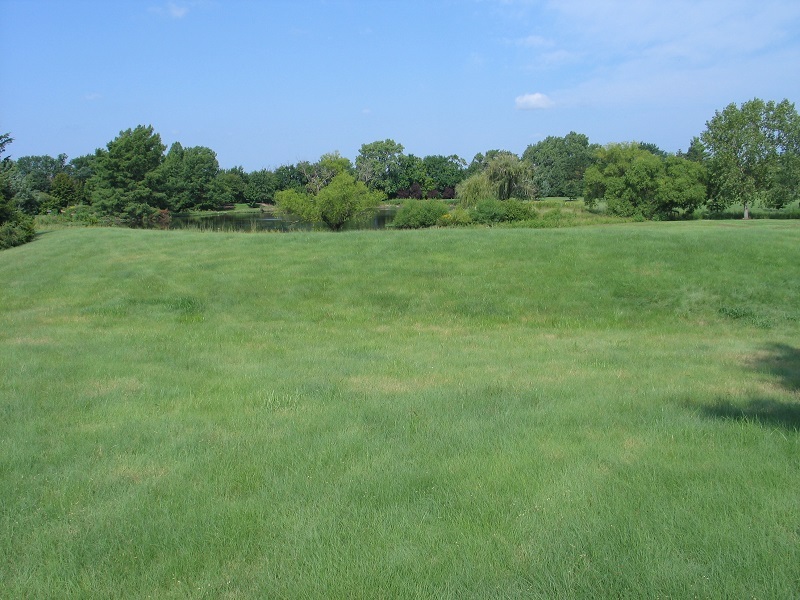 Another option in sunny areas is to use buffalograss, a native, drought tolerant grass, in place of a high water-demand grass like fescue. A home owner beginning to reduce the amount of turf in the landscape. These mulched areas were planted with drought tolerant perennials. Another water-conserving measure that can influence your design is to separate the landscape into zones according to water usage, with areas that are difficult to water, or which are less-used, being planted with trees, shrubs and perennials that require less water to maintain them. Zoning an irrigation system to accommodate the water requirement of the different areas of the landscape further aids conservation. Proper preparation of the site is also an important consideration. Constructing retaining walls, or terraces, where steep slopes favor excessive water runoff is one suggestion. The planting of deep rooted wildflowers and native grasses are another viable option to holding these slopes in place. Planting wetland species along the Arboretum rain garden near the greenhouse. 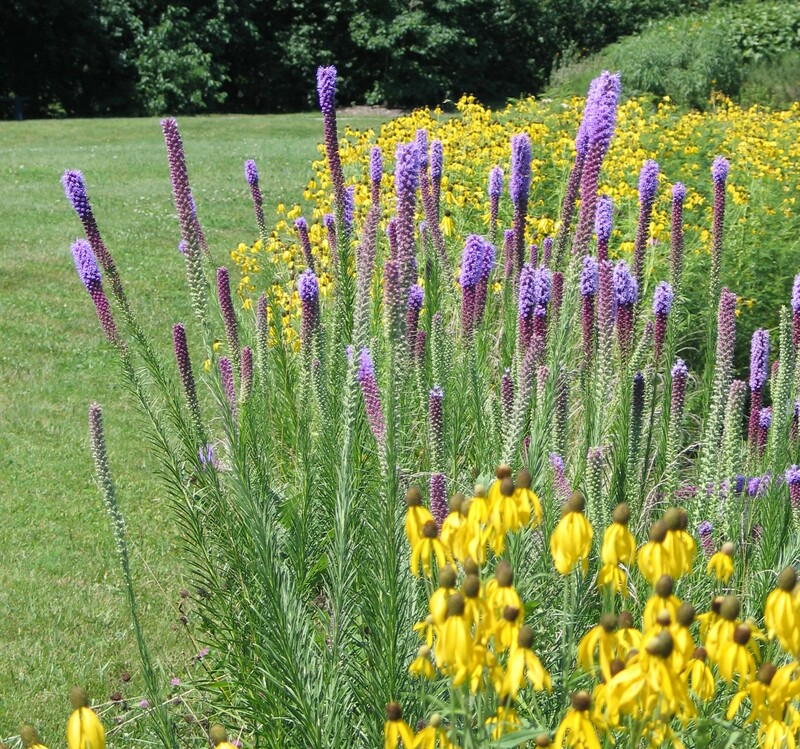 These plants quickly established and are holding the shore of the rain garden from eroding. The use of mulches to cool the soil and reduce water evaporation is also helpful. 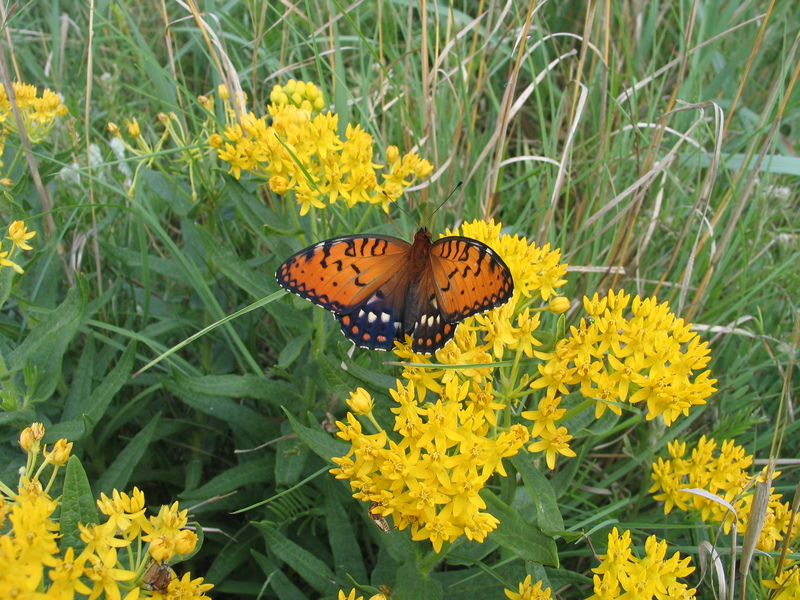 A newer technique is the inter-planting of wildflowers and grasses that mimics the natural prairie system. 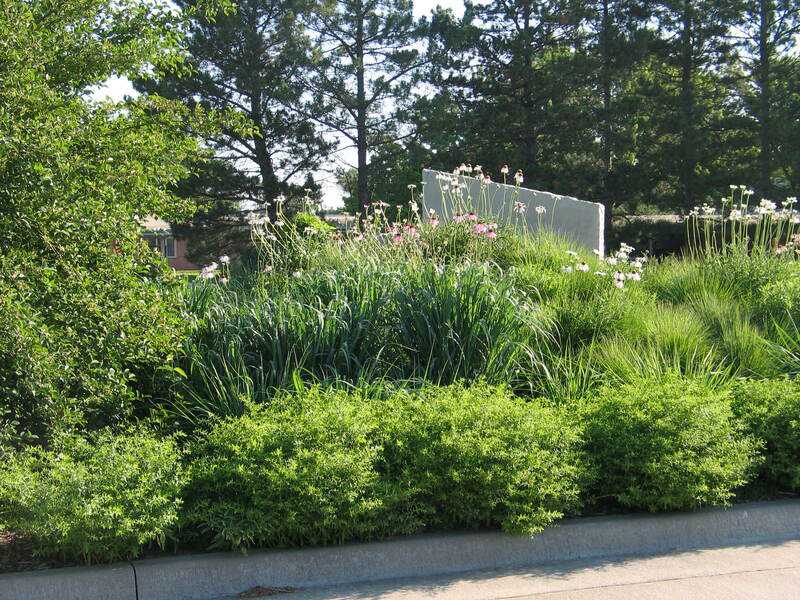 By planting closely so all layers are covered with plants from the ground level to the higher, more ornamental plants, you will also reduce overall water needs while reducing weed competition. Obviously, a major part of an overall water conservation program is the use of low water-demand plants. 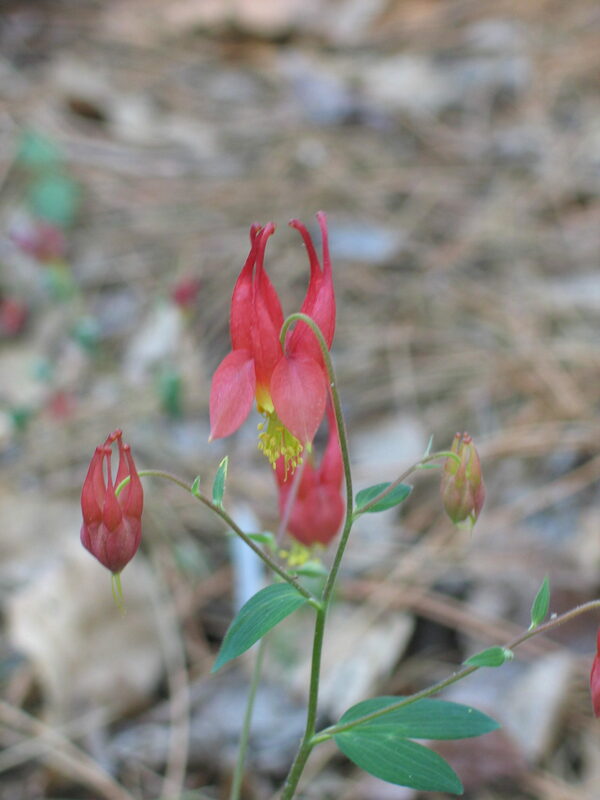 Native plants are particularly valuable for this, since they are already adapted to the region’s precipitation amounts and patterns as well as summer heat and winter cold. Once established, these plants should do well with little or no supplemental irrigation. Curtis Prairie, the world’s oldest reconstructed prairie, at UW-Madison Arboretum. Photo by Brad Guhr. 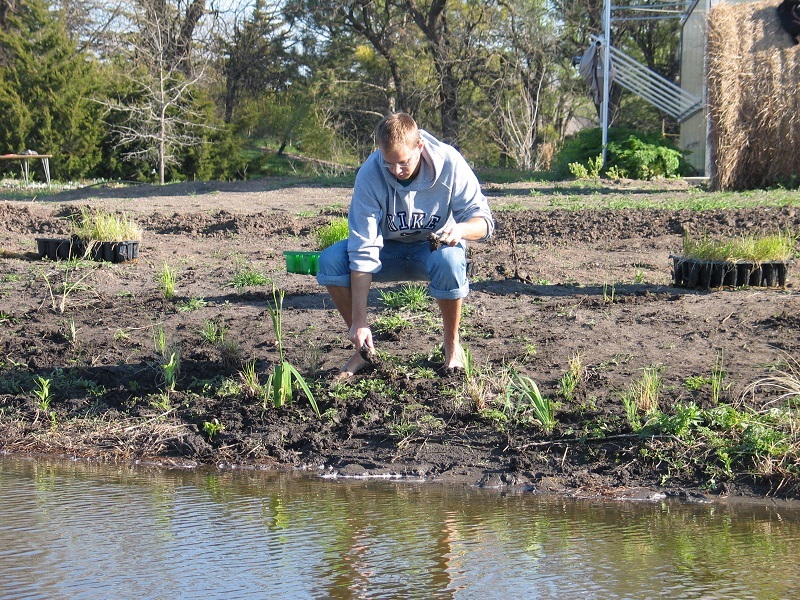 At the Arboretum, we are concerned about water conservation from both an ecological and economic standpoint. We think critically about the plants we use. This is not a perfect system, but we manage to maintain our 30 acres with a water budget of only $7,000 or less. I think this is quite a feat, since we have so many intensively managed and beautiful display areas. 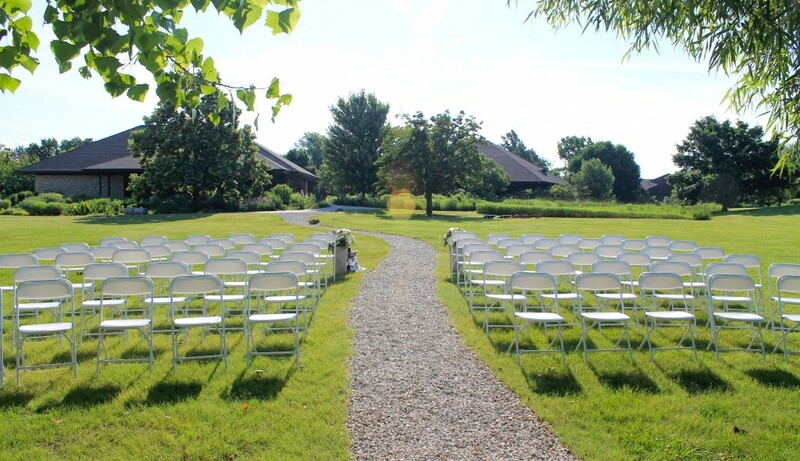 Buffalograss is used extensively as turf and we select deep rooted native and adaptable perennial, trees, and shrubs. The reasons for conserving water are many. It will take all of us doing our part to begin to reverse the water trends. Why wait to have water restrictions forced on us? With a few changes now, we can save ourselves money and benefit the environment in the process. One of the more exciting trends in gardening today is the use of grasses, not for lawns, but as ornamental plants. 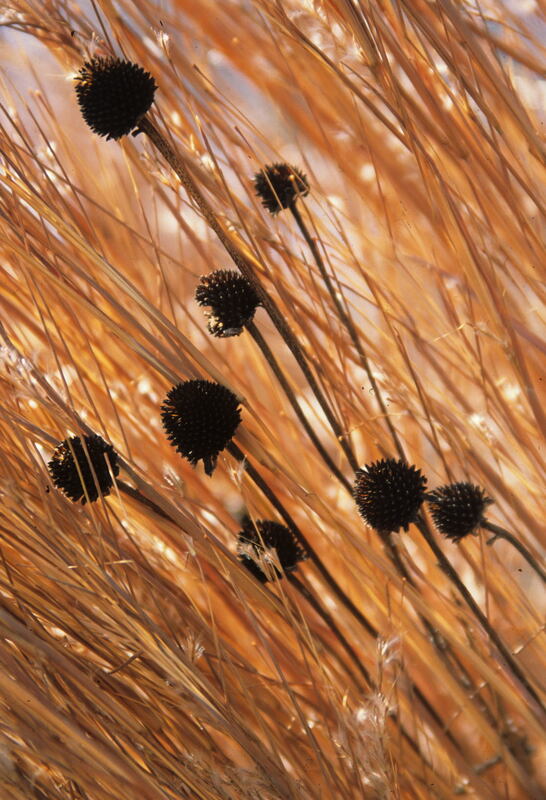 Even though they do not have showy blooms, grasses can add graceful beauty to gardens and landscapes. 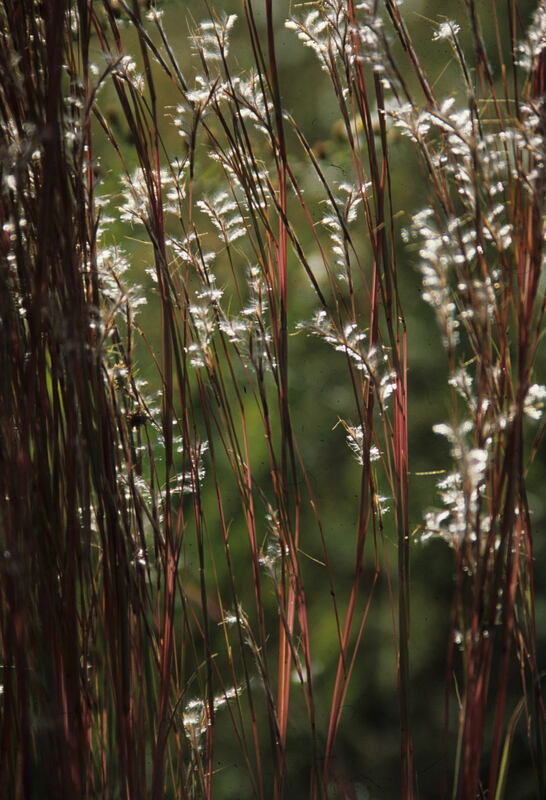 With long narrow leaves and upright habit of growth, grasses have a fine texture, which can provide interesting contrast to other plants in flower gardens. They can also be used alone as accent plants in the landscape. Many grasses produce attractive seed clusters and have foliage that changes color at the end of the summer. The dried foliage of grasses can be left standing through the winter, adding movement and texture to the landscape when garden flowers are dormant and tree branches bare. Little Bluestem and Coneflower seedheads. 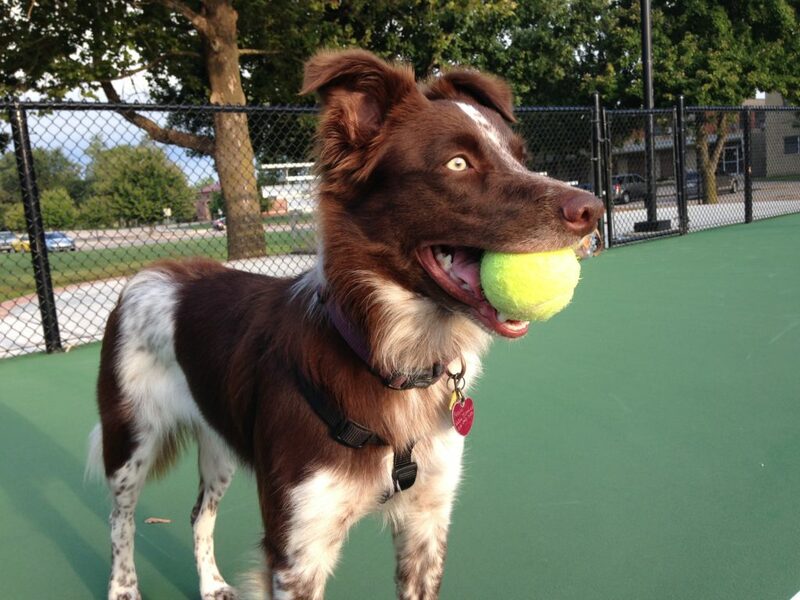 Photo by Emily Weaver. Many of the grasses being used in landscaping today have their origins in Asia and Europe. 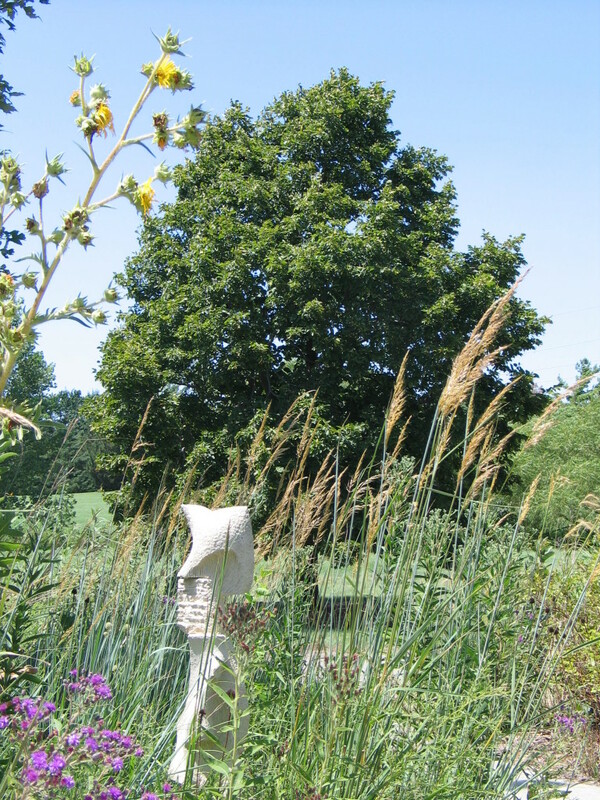 There are a number of different grasses from our prairies, however, that also make excellent ornamental plants. 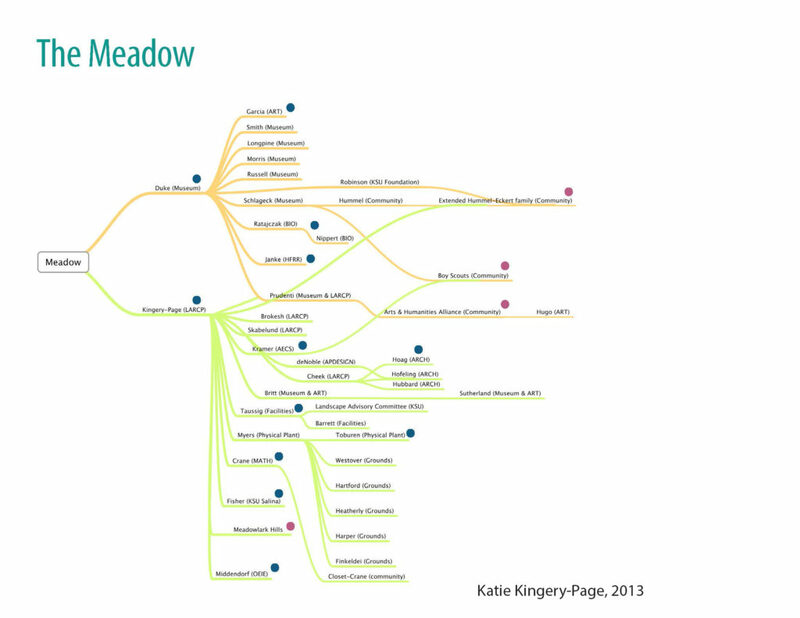 These native grasses possess the added advantage of being well adapted to our soil and climate. Big bluestem, indiangrass and switchgrass are three tallgrass prairie species that make attractive plants in the garden or landscape. Growing 4-6 feet in height, they can be used in flower beds and borders as screens and as accent plants. 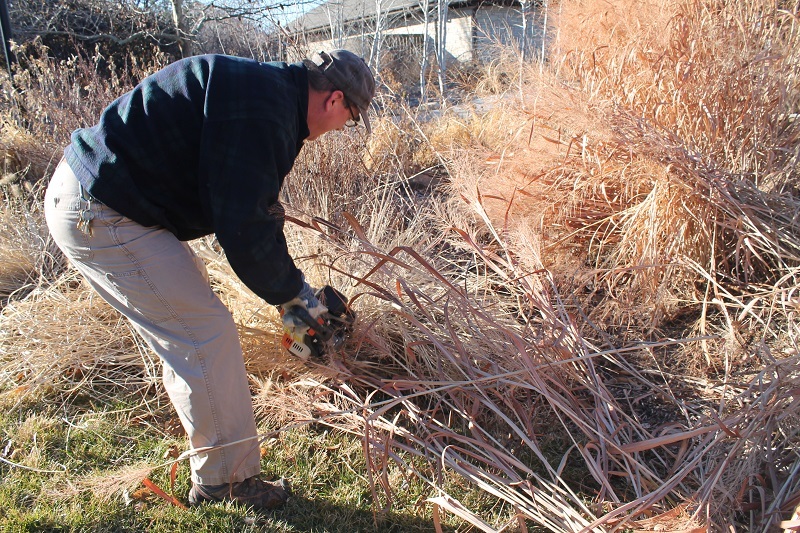 Switchgrass is the most common of these added to landscape designs because of cultivars like ‘Northwind’, ‘Cheyenne Sky’ and ‘Totem Pole’, which offer consistent height and color year after year. Like the leaves of certain trees, the foliage of these grasses also changes color with the onset of fall. Big bluestem is particularly noted for its reddish fall color. Each of these species also produce distinctive seed clusters that add interest to the plant toward the end of the growing season. The seed clusters are shaped like a turkey’s foot. Indiangrass produce attractive golden plumes. Switchgrass seed cluster are open and feathery. Indiangrass plumes. 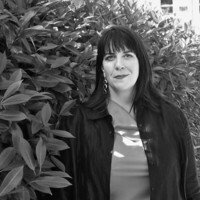 Photo by Brad Guhr. Sand lovegrass is another attractive taller species. 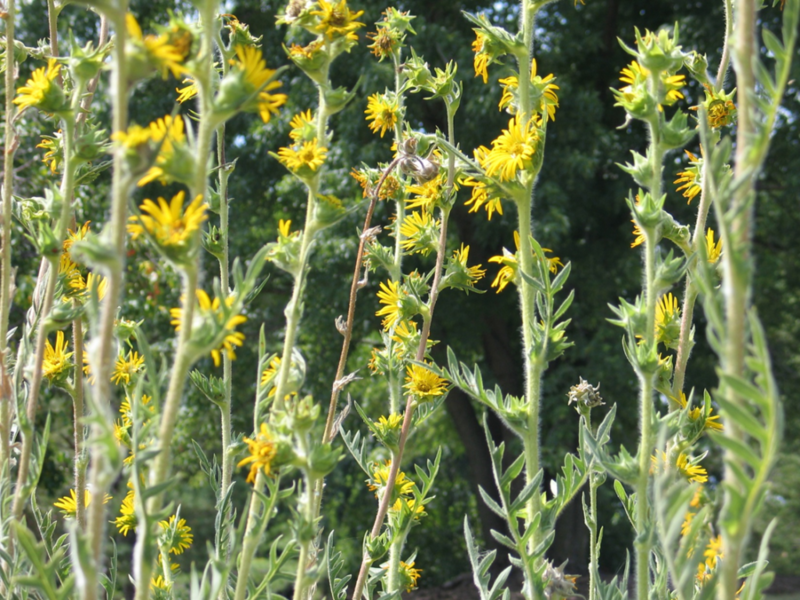 It grows 3-4 feet tall and is found in sandy prairie areas. It produces graceful arching foliage and open, airy seed heads. 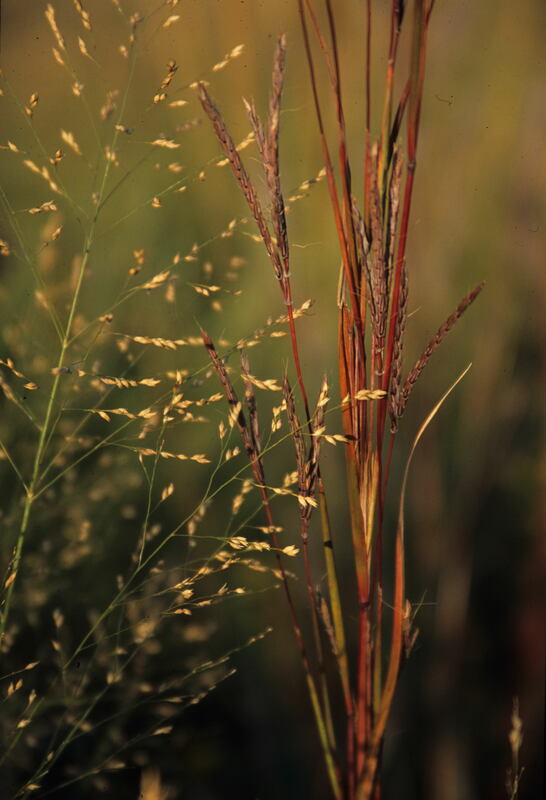 Although found throughout much of the Great Plains, little bluestem and sideoats grama are two grasses that are particularly characteristic of the mixed grass prairie region of central Kansas. Both make beautiful additions to gardens and landscapes. Little bluestem is a fine-textured, clump-forming grass that grows 2-3 feet tall. Its landscape value is enhanced by its attractive reddish coloration late in the growing season. 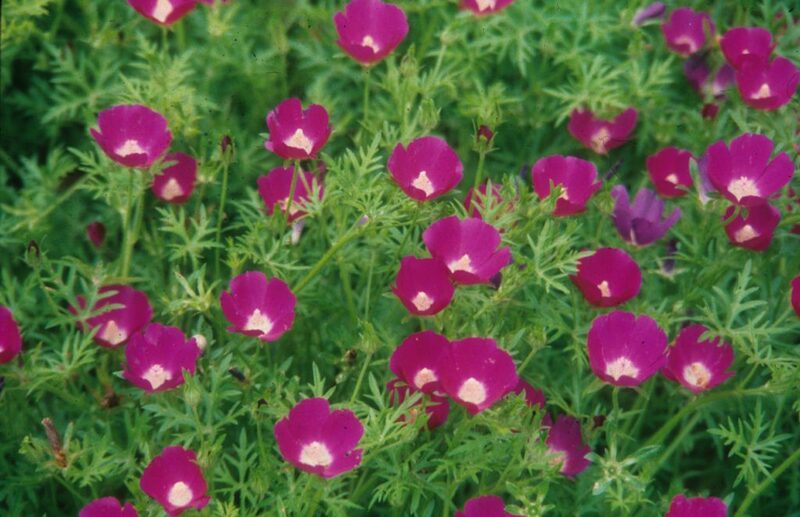 There are several selections that offer nice winter coloration and sturdy habit. Beautiful little bluestem in fall. 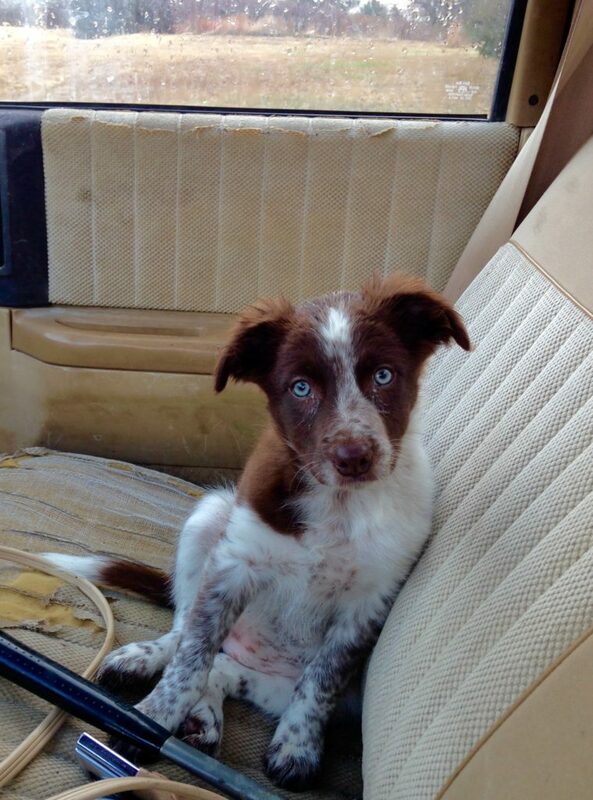 Photo by Emily Weaver. Prairie Dropseed is a favorite of mine because it is long-lived and tough. 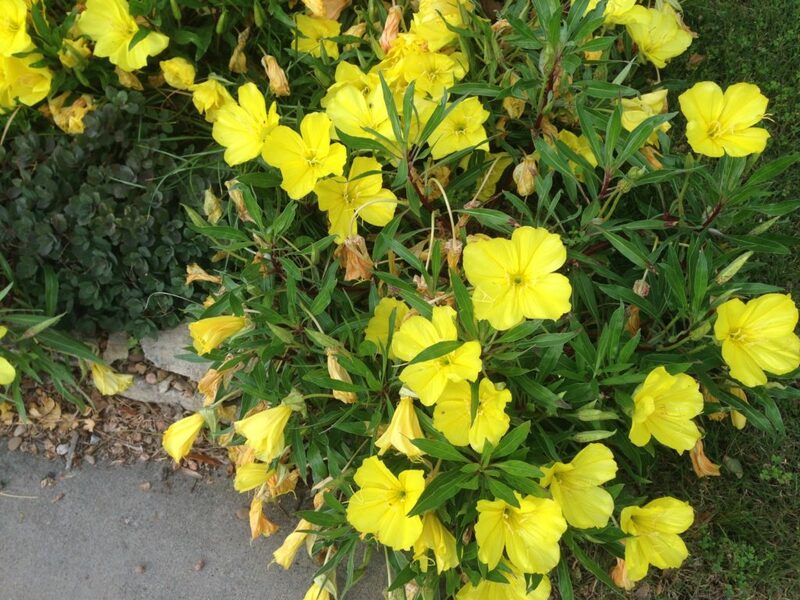 It is so tough, that they are often planted in mass in street medians. The fine textured leaves and airy, fragrant panicles are a nice addition to any landscape. Each clump can reach 12-18 inches wide and up to 24 inches tall. The entire plant turns shades of orange and yellow in the fall, providing multiple seasons of interest. It is great in a border, as a groundcover, in an informal prairie setting or as an accent to other short or mid-range perennials. 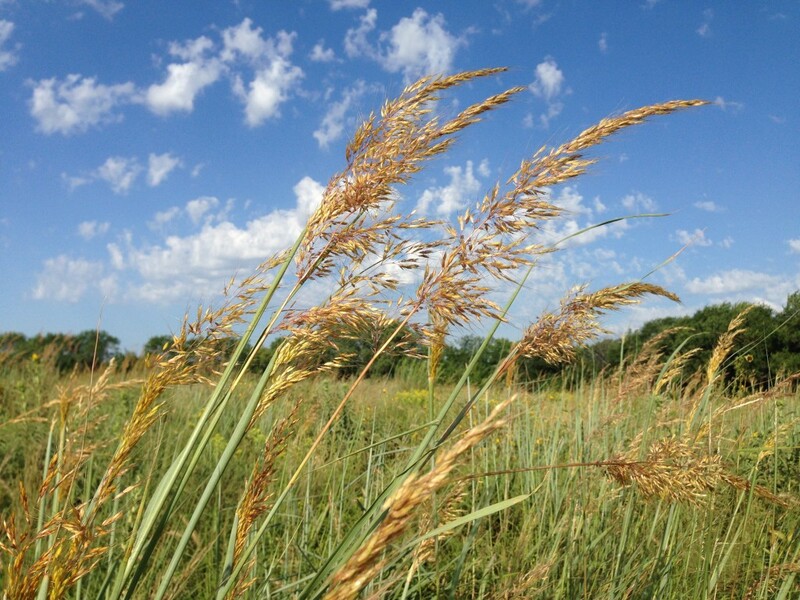 For people who live in prairie country, it may be easy to take our native grasses for granted. Yet these plants with their simple form and subtle beauty, can make attractive additions to the home landscape. Switchgrass and big bluestem. Photo by Emily Weaver. 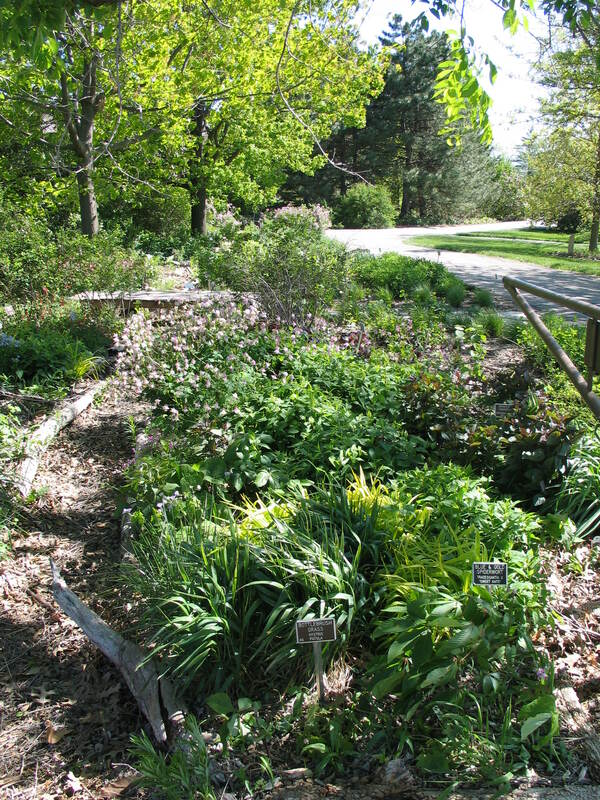 Can A Shade Garden Be Created In Kansas? “I have shade in my yard, what can I grow?” We get this question every year at our FloraKansas Plant Festivals and I admit it is a challenge to come up with plants that will thrive in shade. 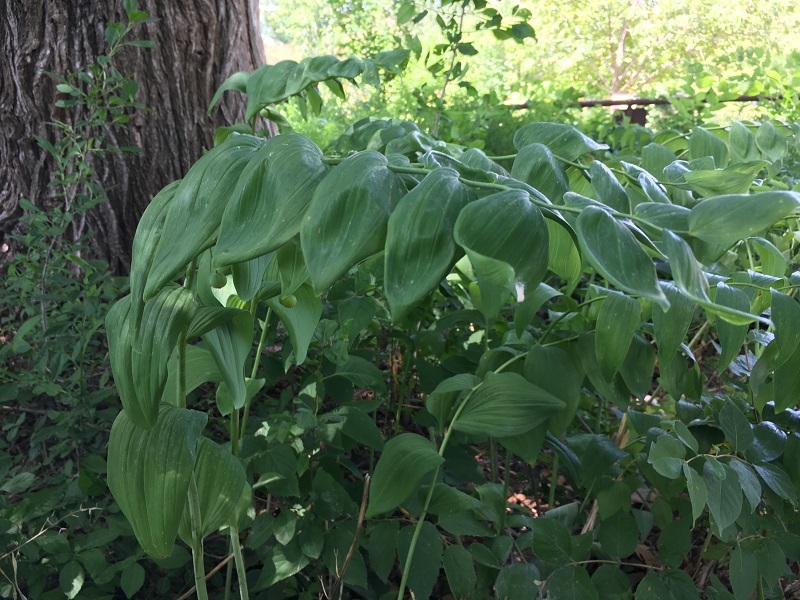 The difficulty with trying to grow shade plants in our area in not that we have shade, it’s that we have shade in an area that once grew sun loving deep rooted prairie plants. Trees have been added to our landscapes out of necessity and the prairie has been pushed out due to lack of adequate sunlight. The inconsistent rainfall and root competition of the trees are a real challenge to shade-loving perennials, shrubs and understory trees. So what can we do to create a shade garden? Choose drought tolerant shade loving plants. 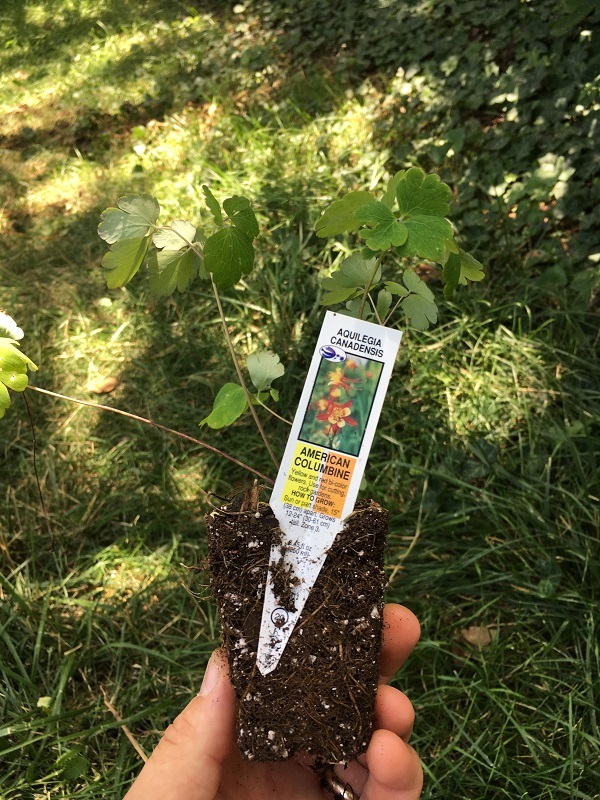 These new additions to your shade garden should be smaller and don’t require digging a deep hole and disturbing tree roots to get them in the ground. Establish an area that can easily be managed and maintained the first couple of years. Keep in mind that root competition and irregular rainfall will require consistent moisture from you the first year until the new plants can weave their roots through the tree roots and live in harmony together. This is not a quick fix. The roots of your shade plants develop slowly so you need to watch and wait to see what these plants need. The first two years are vital to the success of your shade garden endeavor. You will need to water them regularly to encourage growth. Work with the plants to create an environment in which they will thrive. Your patience will be rewarded with new blooms several years into the future, but you have to start now to see this happen. Let face it, there are not as many showy flowering plants for the shade compared to the vast array of sun loving prairie plants. So, we need to include plants with interesting forms and foliage. A good example of this are the arching stems of Solomon’s seal. A group of these growing happily together are very striking. Incorporate plants that flower but don’t forget the architecture that give additional visual interest. 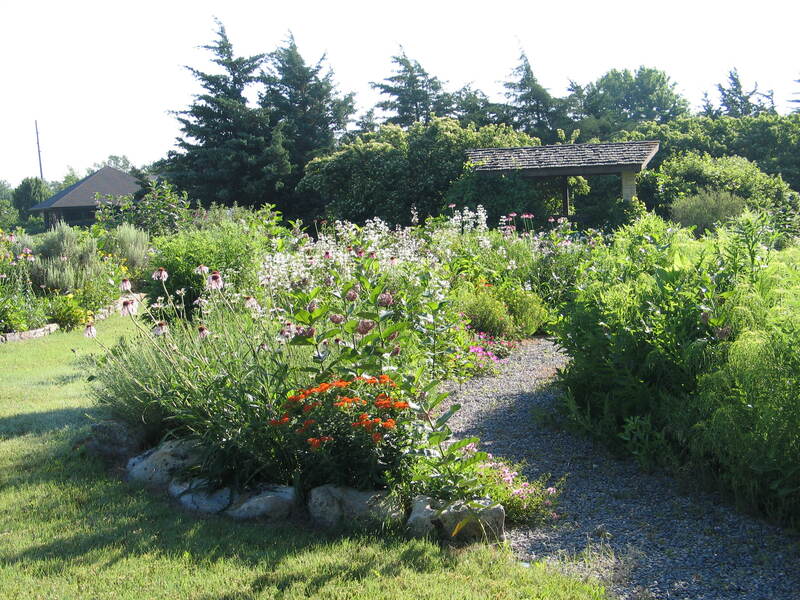 Great shade gardens have a balance of flowers and foliage. Leave the leaves as protection and organic matter. As the leaves decompose, they will supply nutrients to the fledgling plants. The natural processes that make a woodland work effortlessly need to be replicated as closely as possible. Woodland plant communities rely on the nutrients from the canopy and twigs that are slowly broken down and released back to the soil. Too much fertilizer creates all kinds of problems, but the most obvious is too much growth with not enough sustainable roots. CLICK HERE: For a list of shade loving perennials and shrubs. Trees in Kansas are a blessing, not a curse. We enjoy the shade, but often struggle to find the right plants for that barren shady spot under the trees. 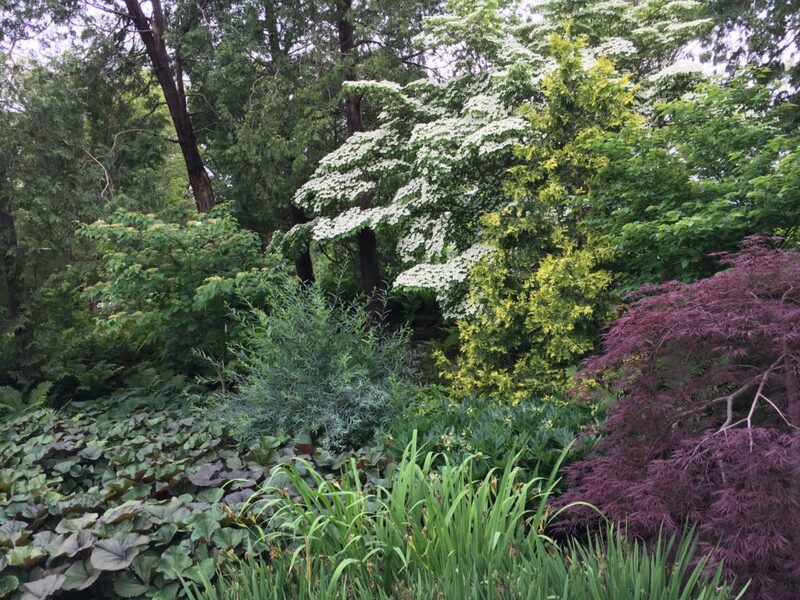 Some properly chosen plants and some patience along with timely watering will make your woodland garden more natural and resilient over time. The roots of the trees and roots of the shade plants co-mingle in our soil, sunlight and climate. Even the most tranquil forest settings we have seen have complex processes and interactions taking place. So, be patient and you will be rewarded with happy plants for years to come. What is the Key to Native Plant Happiness? 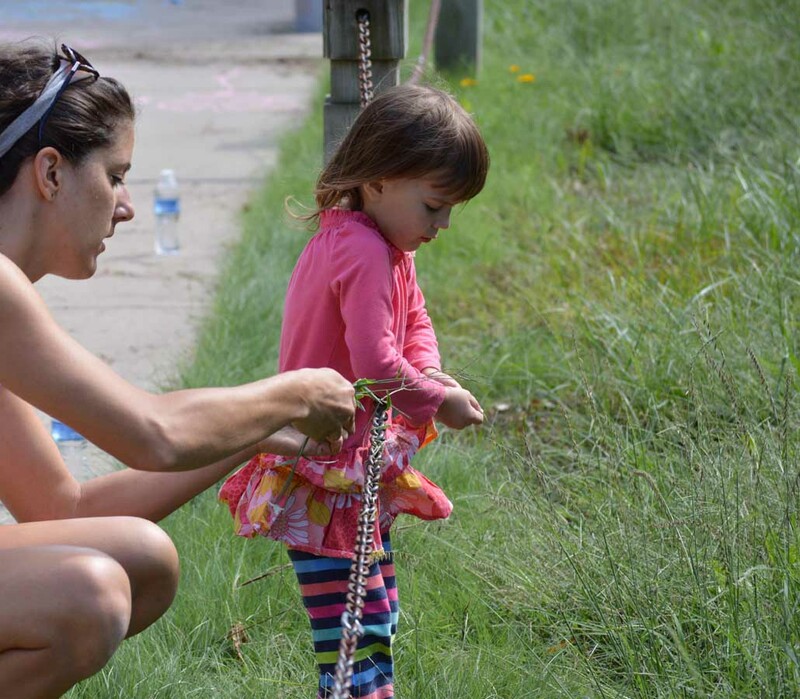 One of the questions we get every year at the FloraKansas Native Plant Festival, is “why didn’t my ___ come back this year?” It is a great question. Every year at the Arboretum, we ask the same question with some of the plants we establish and want to grow. I wish there was a right answer for every situation and every scenario, but every landscape is unique. Here’s the hard truth that many gardeners don’t often want to hear: the key to native plant happiness lies in identifying this uniqueness and finding the right plants for your plot. Your landscape is a micro-climate all its own. The soil, sun exposure, orientation to your house, root competition from trees, and many other factors make your garden special. Even your neighbor overwatering their lawn can impact what plants grow best in your scene. There are hundreds of factors that relate to the happiness of your plants and whether or not they will thrive. 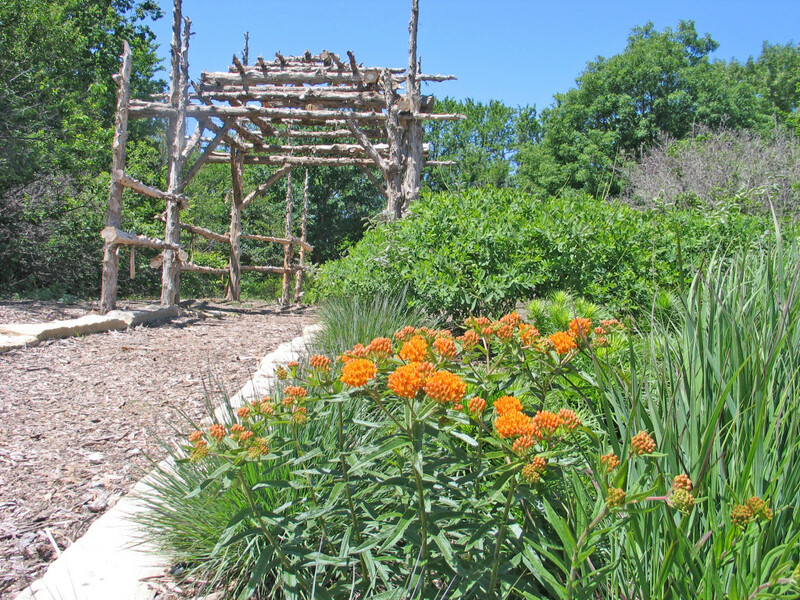 The most critical step when establishing your native plant garden is matching the plants with your site. Sometimes I want to try a certain plant in a certain spot that has no business being planted there. I have done it too many times to mention and the result is always the same. I am left holding the hand of a struggling plant that would be much happier someplace else. In the end, I either move it or lose it. If we are honest, I think we have all planted before preparing. The wilting plant in the flower bed is a constant reminder to me that I didn’t do my homework. Look at your landscape. Is it sunny or in the shade? Is the soil clay or sand? Become familiar with prairie plants that grow in similar situations and evaluate the elements that will impact their survival. Choose plants that will thrive in the micro-climate of your yard. 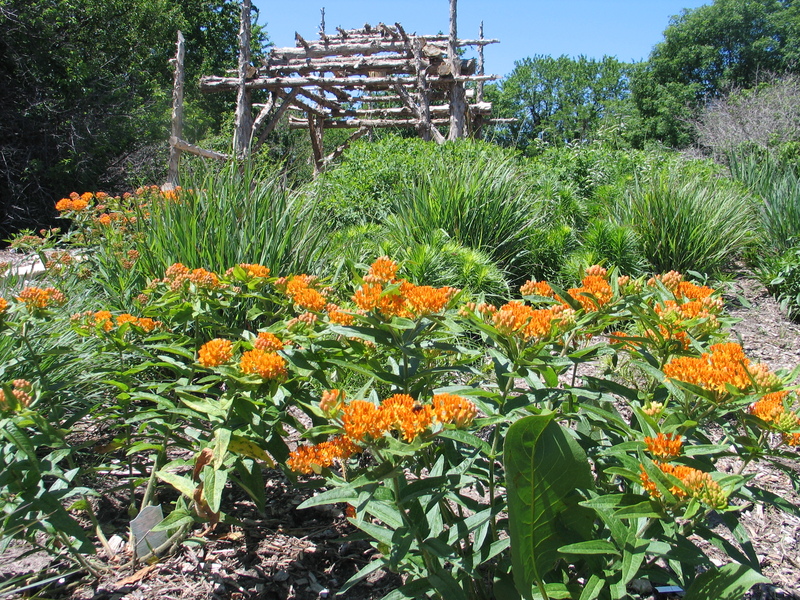 Sun-loving native plants need at least 6 hours of direct sunlight to grow happily. If your flower bed receives less than 6 hours of sun, look at more shade-loving natives. 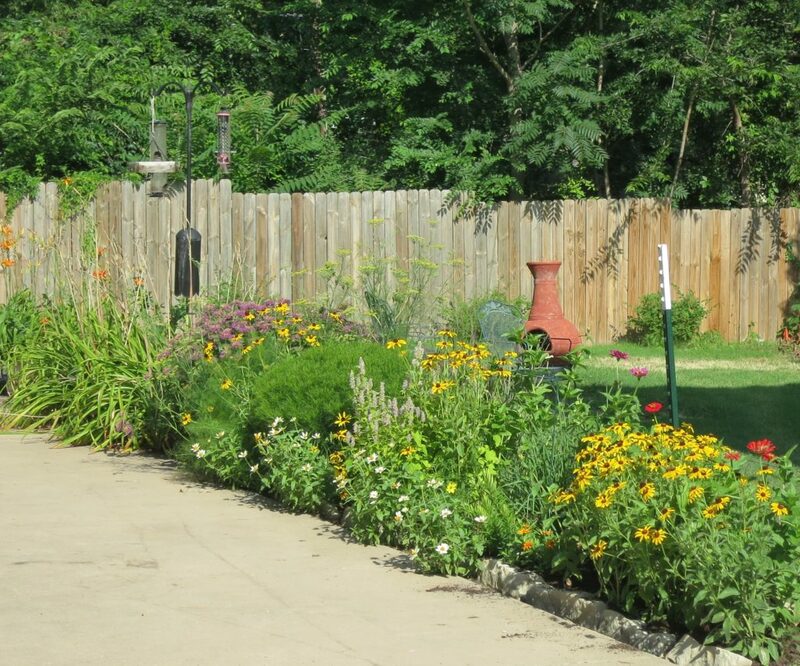 A thriving landscape begins with matching plants to your one-of-a-kind area. 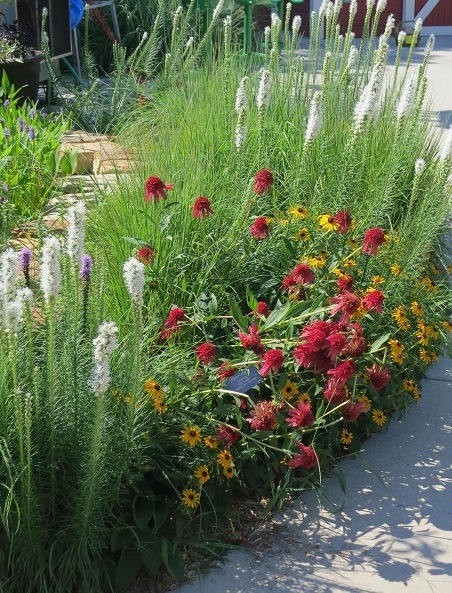 For a lower-maintenance garden, choose plants that occur in the same or similar prairie climates. Anytime you stray too far off, the plants don’t flourish and they require more effort to keep alive. Planting a swamp milkweed on a dry hill or a Missouri evening primrose in a bog will never work. Good gardeners have lost their share of plants over the years, but what makes them good gardeners is that they learn from their mistakes. With lots of trial and error under their belts, they/we should make better choices…in theory at least. Other design elements such as succession of bloom, patterns, year round interest, heights, and visual elements become less important when your plant is unhappy in its current location. You must get the right plants in the right place and the other elements will come much easier. A healthy garden begins with a connection to your landscape personally. As you watch and learn what your landscape needs and what it can sustain, you will be able to link the appropriate plants to the location. This important step in the design process allows you to spend more time enjoying and less time “working” in your garden. We all want that from our gardens. Sometimes plants, through no fault of our own, defy all of the above-mentioned rules and simply don’t return. Even in the prairie, plants are ephemeral and rely on self-seeding to continue to grow in an area. As you become more familiar with native plants (and I’m still learning too), you will be able to identify these species. It is their nature to be short lived. 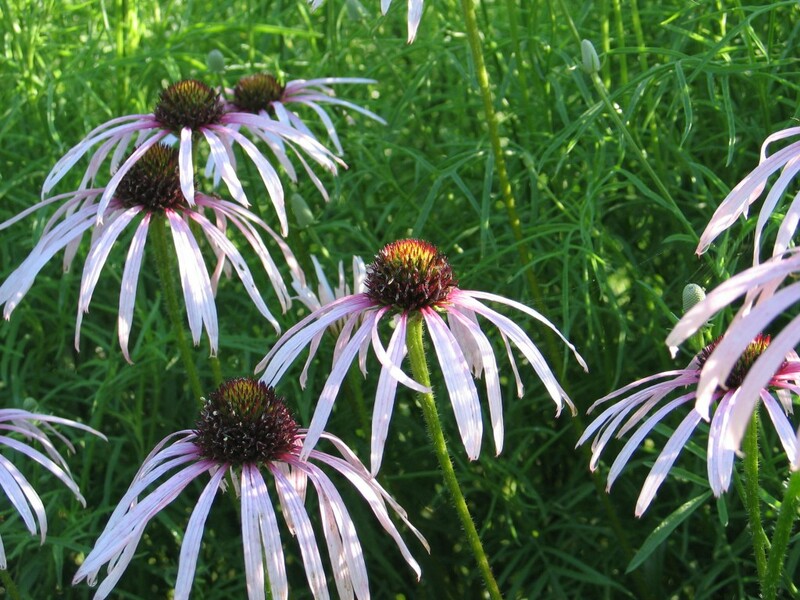 True native coneflowers have this characteristic. They are worth planting, but may need to be supplemented with new plants from time to time to keep the area full.